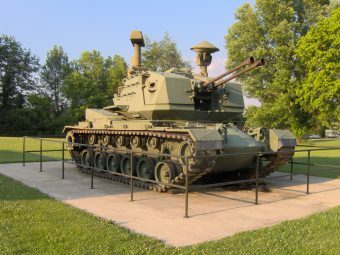 The M247 Sergeant York was officially designated as a “self-propelled anti-aircraft gun” but was for all intents and purposes a tank chassis with anti-aircraft guns attached to the top. The vehicle was named for one Alvin York, a famous and highly decorated WW1 hero who captured over 100 German soldiers pretty much single handedly. Unfortunately for the U.S. tax payers who spent just shy of $2 billion on it (about $4.8 billion today or, humourously enough, after appropriately adjusting for inflation to make the dollar values match, about 1/11th what the entire Apollo program cost), the final version of the weapon ended up being so useless its automatic targeting system couldn’t distinguish between a toilet vent fan and a jet plane, the vehicle itself couldn’t keep up with the tanks it was designed to protect, and it was made obsolete by advances in enemy weaponry after only a few dozen faulty units were made. Here now is the story of the forgotten M247. This particular weapon was developed by the defunct off-shoot of Ford known as Ford Aerospace in response to a contract put out by the U.S Army in 1977 requesting what they referred to as an: “Advanced Radar-directed Gun Air Defense System”. This was later re-dubbed, “Division Air Defense” which was itself shorted to DIVAD in official documentation. In a nutshell, the Army wanted a drivable anti-aircraft system that was to serve alongside their newly developed M1 Abrams and M2 Bradley tanks in battle. The contract was put out in direct response to a battle tactic known as “pop-up” which essentially involved helicopters harassing tanks from a distance by hiding behind cover and then popping up briefly to let loose a volley of anti-tank missiles (which themselves were a newly developed technology) before hiding once again. The U.S. Army found that the tactic was almost impossible to counter with the ground based weapons it had available at the time as their leading anti-aircraft weapons system, the M163 Vulcan, only had a range of 1.2 KM (3/4 of a mile), while newly developed anti-tank missiles, such as the 9K114 Shturm used by the Soviets, could hit from a range almost five times greater than that. To add insult to injury, the Soviets had no problem countering the pop-up attack method thanks to their ZSU-23-4 Shilka, which is essentially what the United States wanted to copy. To minimise production time and cost, the Army specified that the basis of the newly developed system had to be mounted atop an M48 Patton tank chassis (something the Army had in great surplus). Further, the system had to more or less use off the shelf parts, rather than anything being developed from scratch. As to the final specific capabilities it was supposed to have, it had to be able to keep up with the M1 and M2’s cruising speed and be able to lock onto any target within 8 seconds, all with a minimum 50% chance to hit a target from 3 KM (1.9 miles) away with a single 30 second volley. It also had to be able to continually track up to 48 moving aerial targets, automatically identifying enemy aircraft, and intelligently prioritizing which should be shot down first. All the gunner had to do then was to select the target from the generated list and fire. Several companies responded to the request with proposed systems, with the Army ultimately narrowing it down to two entrants- one developed by Ford Aerospace and one by General Dynamics, with both companies given $79 million to develop prototypes. As you might have guessed, this decision was controversial, not just because the General Dynamics prototype outperformed Ford’s by a considerable margin, but because, unlike every other entrant, the M247 used more costly 40MM shells instead of 35MM ones which were extensively used by NATO at the time. Rumour had it that Ford stood to make more money from the use of 40MM rounds due to a business deal they had with the manufacturer. However, it should also be noted that the Army may have had good reason to favour the 40MM given its larger size and a newly developed 40mm round that had a proximity sensing fuse built in. Whatever the case, Ford Aerospace won the lucrative contract and began immediate production of M247s in 1981. And this is where hilarity ensued. Every M247 Ford produced had problems, mainly centered around their automatic targeting system. This ultimately led one soldier to speculate that the only way the M247 would manage to take out an enemy would be by “driving over the top of it”. As an example of some of the issues here, in 1982 Ford was set to demonstrate the M247 to a gathered crowd of VIPs and military brass. However, the moment the M247’s tracking system was turned on, it immediately targeted the stands the gathered people were sitting in, resulting in complete chaos as those present trampled one another to get out of the way. Of course, the M247 required the operator to tell it to fire, so there was no real danger here, but one can imagine staring down a pair of 40mm cannons in a live demo would be a tad frightening. After a while the engineers thought they’d managed to fix the issue and the demo resumed, only to see the M247 shoot into the ground rather than the drone target it was “locked on” to. In the aftermath, a Ford Aerospace executive claimed the “glitch” had been caused by the M247 being washed before the demonstration, damaging the targeting system. This explanation didn’t sit well with military brass or the many journalists present, one of whom, Gregg Easterbrook, mused that perhaps Ford Aerospace didn’t realise that it rained in Europe where the M247 was to be deployed. Other problems with the M247’s targeting system included its seeming inability to tell the difference between helicopters and trees and its penchant for locking onto random other ground based objects as threats. The most infamous example of this was that time an M247 ignored a passing drone it was supposed to be targeting and instead locked onto a nearby latrine exhaust fan, marking it as a low priority, slow-moving target. The M247’s targeting system was so poor that even when presented with an unrealistically favourable scenario, such as a helicopter hovering completely still in mid-air, it still missed and took an agonising 12 seconds just to acquire the target. Another major problem, as previously mentioned, was that the M247’s top speed wasn’t sufficient to keep up with the M1 and M2’s cruising speed, meaning it literally couldn’t drive fast enough to travel with the things it was specifically designed to protect. You might at this point be thinking that one’s on the Army because they’re the ones that made Ford use the M48 Patton tank as the base, and that’s not an entirely unfair thought. However, it should be noted that the M48 was previously capable of keeping up here, but Ford added about 17 tons to the original 45 in their modifications of the turret, making the tank much slower than it had previously been. Despite all these problems to units being delivered, the Army continued to pump money into the project, mostly because there wasn’t a backup option and there was a very pressing need for such a weapon. However, rumours of the Army faking positive results for the M247 via putting it in unrealistically favorable conditions (such as hovering the drones and attaching radar reflectors), including Oregon state representative Dennis Smith going so far as to publicly accuse them of this, ultimately led to something of an inquiry on the matter. Specifically, in 1984, Secretary of Defence Caspar Weinberger decided to oversee a set of amazingly expensive tests costing $54 million ($144 million today) to better determine what this weapon could and couldn’t do. All was not lost, however. In one of the rounds of tests where a drone was moving the M247 did manage to slightly damage it, knocking it off course, at which point the safety officer remotely self-destructed it as he was supposed to do if a drone did such a thing. Nevertheless, this was interpreted by the press as the military trying to make it look like the M247 had actually managed a kill, leading to even more outcry that the Army was just trying to fake the results to make the massively expensive M247 look good. In any event, around the same time of the debacle that was the 1984 tests, the Soviet Union were deploying longer range anti-tank missiles that were capable of being fired outside of the then current range the M247 could effectively counter the attacks, even if the system did aim properly. Thus, despite the pressing need for such a system with little in the way of a backup, Weinberger, with support from congress, some members of which had been present at the test, cancelled the project rather than trying to sink more money into it to fix it. In the coming years, most of the M247s found their way onto target ranges where they were destroyed in various tests by weaponry that could actually aim properly. Today, only a handful of M247s still exist, one of which can be found at the Sgt. Alvin C. York State Historic Park. I remember when I was stationed at Scott AFB, IL getting a message from the DIVAD program office offering to send complete fire units to any unit willing to pay for shipping. Couldn’t get my boss to go for it, though. “….M2 Bradley tanks….” The Bradley is not a tank. The guns were 60mm not 40. I worked on that program in the mid 80s prior to retiring from the Army. The Sgt York was not just an air defense weapon system, it was also ground defense. The upper magazines held proximity rounds, the lower magazines held HE rounds. You’re not the only site to get this wrong, Wikipedia also has it wrong. I believe the guns were 40mm. This well established. What a strange comment. There are hundreds of reports, articles, photographs, etc. about the Bofors 40mm gun system used on the Sergeant York. There is no 60mm anti-aircraft gun that has ever been produced. I’ll be generous and presume this comment was a “senior moment”. I worked with all of the people on this program; they were from Frankford Arsenal and Rock Island Arsenal. They had little experience in managing a program or technical experience. I told them you need to put missiles on that platform to hit anything. Air defense in the Army needs help. So much spent money and very little system fielded (no systems fielded in 35 years).